With increased questions about food safety, consumers want to know where their food comes from and how it is grown. The Siskiyou Sustainable Cooperative provides certified organic fruits, vegetables and specialty items produced on nine small-scale family farms and ranches in Southwestern Oregon. Through our cooperative Community Supported Agriculture marketing and distribution program, we are able to feed 250 families in the Rogue Valley while enhancing the economic viability of our sustainable agriculture operations. The CSA connects consumers directly to these local organic farmers. As a CSA member, consumers support these farms by investing in shares of the upcoming harvest. They then receive a weekly supply of fresh organic produce though out the season. 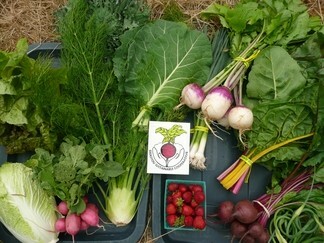 The CSA delivers to most areas in the Rogue Valley and will expand to add drop points in Central Point and Eagle Point. The CSA is the only CSA in southern Oregon able to accept SNAP benefits. The season’s produce deliveries will begin in early June and continue until late Nov.